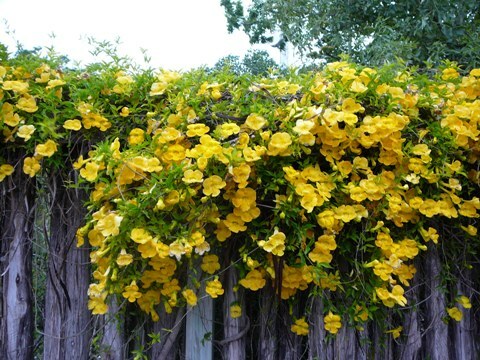 The Catclaw Vine (Macfadyena unguis-cati) is an old-fashioned, large-growing vine bearing masses of butter-yellow trumpet-shaped blooms in the spring. It deserves greater recognition in today's landscape because it is very tolerant of drought and varying soil and climate conditions, and is a rampant grower (perhaps too rampant, to some gardeners). Due to this vine's adaptability and vigorous growth habit, it may become naturalized in some regions. check with local nursery professionals, County Extension Agents, or Master Gardeners for their thoughts on this vines appropriate use in your area. If there is a need for a vigorous vine to cover a large wall area or to climb over unsightly objects in the landscape such as an old shed, there cannot be a better subject. From earlier times to the present gardeners in Savannah and Charleston used it to good effect to run along the tops of brick walls, where the glorious yellow blooms could be admired from a distance. The Catclaw vine is a native of the region from the West Indies to Central America and Argentina, and has been present in the South for many years. It is able to keep its leaves in Zones 9 and 10, but will lose them in Zone 8 during colder weather. It has often managed to escape into nearby neighborhoods and areas surrounding towns and is virtually unnoticed in the tops of trees as far up as 50 feet, until a shower of spent golden blooms falls at the feet of the observer. The three-part leaves are dark green and lance-shaped and resemble those of the Cross Vine (Bignonia capreolata) - it was once was considered a member of the Bignonia family. The name "unguis-cati" means "catclaw" in Latin, because the hooked tendrils at the growing ends of the vine are very good at catching hold of anything suitable to climb on. Catclaw forms a dense mass of foliage quickly and is drought-resistant when established, due to its large storage tubers which form underground. It does not flower after planting until its stems have become woody and the vine is well established. It may be propagated both by cuttings and from seed. Seedpods are narrow and pealike and are usually 12 - 15 inches long. The vine thrives in full sun and is tough enough to be planted on brick and masonry walls in hot desert areas, according to Dr. Mike Arnold of Texas A&M University. The "claws" are said to be capable of clinging to glass. 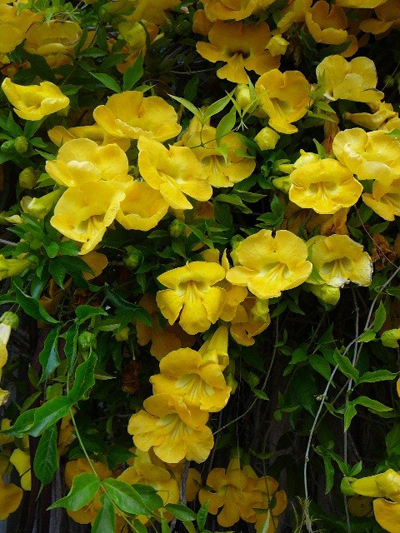 The blooms remind some people of those of the Allamanda vine, and have orange lines in the throat.